Our client, a retired teacher, age 68, came to us after her mother died. She received an inheritance that included her home and a small savings account. Having retired recently, our client was living off of her state teacher’s retirement pension as well as occasional withdrawals from her IRA accounts. Although she had been working with another advisor for a number of years, she never really understood how he was adding value since he rarely made any changes to her mutual fund portfolio, even during periods when the investments performed poorly. Now that she was going to have more to invest, she decided to talk to fee-only advisors. She contacted Pacific Investment Research to see if we could help. To start, we scheduled a meeting to learn about her goals and concerns. We reviewed her current investments and talked in detail about the lifestyle she would like to have throughout retirement. We explained how we would be able to take a more hands-on approach to managing money in a way that she could understand and appreciate. After calling several client references, she decided to switch over to our firm. We then helped create a new overall investment plan that fit her goals and expectations of us as her advisor. Because we developed it together, she understood it and felt confident in the way we would manage it as true money managers, not just outsourcing the money management function to others that she didn’t communicate with. We used proceeds from the sale of her mom’s home to pay off her home mortgage and car loan, and invest the rest in dividend paying stocks and bonds for both growth and income. Our client now feels comfortable with the way her money is being managed. She appreciated our personal interaction with her as both her advisor and money manager. She particularly likes the fact that we follow a disciplined approach to reduce the risk in her portfolio during volatile market conditions. Anytime she has a financial question, she picks up the phone, knowing that there’s never any extra charge for that. 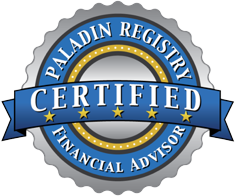 Schedule your complimentary finacial review today.